This morning I felt a little bit bad for Intel. The Core X-series chips are the most interesting thing they’ve done in the high-end desktop space since the glory days of the Skulltrail platform. It’s good to see that they are responding to competitive pressure and that they are willing to adjust their strategy as necessary. Perhaps Charlie came down a shade too hard when he declared that, “Kaby-X is not only a bad product it is a marketing disaster.” But then AMD committed offering all 64 PCI-E lanes and 4 DDR4 memory channels on every ThreadRipper SKU regardless of price, clockspeed, or core count. These Core X-series chips haven’t even been publicly announced for a full 24 hours and already its clear that AMD’s offering the better chip. Once again Intel’s mindless up-selling strategy has given AMD a very valuable window of opportunity to exploit. Even Intel’s best Core X-Series chips will only offer 44 PCI-E lanes, 20 fewer lanes than AMD’s cheapest Ryzen ThreadRipper part. The midrange parts are where the competition will be the most fierce, but even there AMD appears set to offer more cores per dollar and more than double the 28 PCI-E lanes of six and eight core Intel parts. The comparison gets even more silly when we think about the entry-level Core X-series CPUs which are based not on server chips but rather mainstream desktop chips. These Kabylake-X parts offer a mere 16 PCI-E lanes and dual channel memory. Worse yet they are saddled with the complex and expensive socket LGA 2066 socket and X299 chipset. Buying a one of these Kabylake-X chips in place of a standard Kabylake chip is absolutely a mistake. You’ll be paying more money for a very limited performance improvement compared to a Z270-based alternative and gaining the privilege of plunking down 2 to 10 times as much money as you paid for your initial Kabylake-X chip at some point in the future if you decide that you need moar cores. In a weird way I still feel some empathy for Intel’s product planners. From their perspective Kabylake-X and these Skylake server parts probably are the most robust response they could organize on such a short timeline. 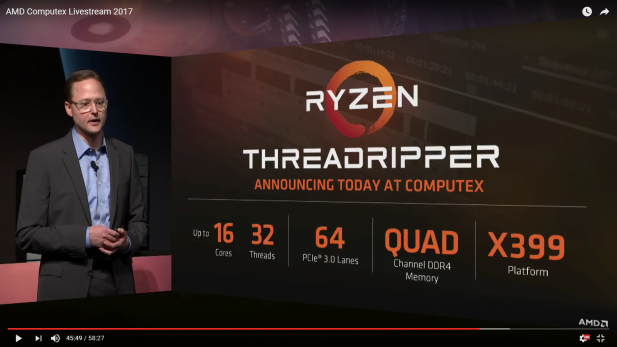 But the two advantages their products are set to offer over AMD’s Ryzen ThreadRipper, a slight lead across the board in single threaded performance thanks to Turbo Boost 3.0, and an extra two cores more than ThreadRipper with one $2K SKU seem like a weak counter when even their best offerings can’t match the worst ThreadRipper SKU’s I/O capabilities. It’s the self-inflicted wounds that are the hardest to stomach. 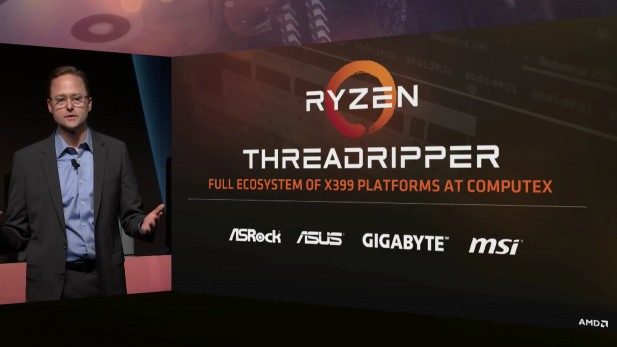 AMD’s Ryzen ThreadRipper demos at Computex were designed to demonstrate this PCI-E advantage by showing off performance in both two and four-way GPU configurations. 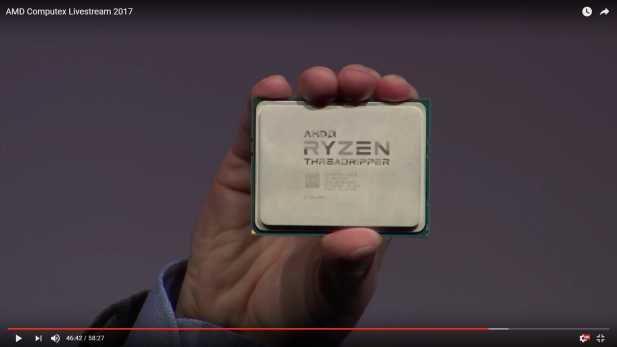 From a technical perspective both Intel and AMD are being rather cagey with the exact specifications of these chips. 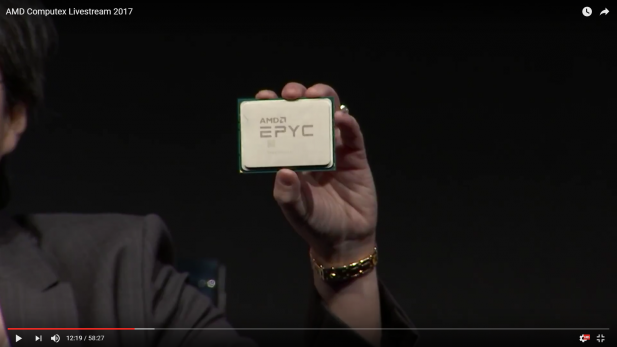 But at Computex we got to watch AMD show off physical copies of both its EPYC and Ryzen ThreadRipper CPUs. What’s worth noting here is that despite the difference in core counts, 32 cores versus 16 cores, both chips appear to use the same physical packaging and socket. There are also different names for this socket going around. Motherboard vendors like ASUS are calling it socket TR4, while older roadmaps and engravings in the Foxconn supplied retention brackets on the X399 motherboards say socket SP3. Perhaps there is no difference, or perhaps TR4 is a limited version of SP3 that shares the same physical infrastructure. I have no doubt that this mystery will be sorted out shortly. It good to see that AMD’s found willing partners in all of the major motherboard makers for their risky new platform. That said AMD’s X399 chipset seems like a decent if rather unremarkable offering. Desktop chipsets these days always seem like a bit of an after thought. Intel’s X299 and AMD X399 chipsets are not exceptions to that trend. On the other hand motherboard feature sets are more robust than ever and average build quality is a high point so perhaps this new normal is a good thing.